It's finally here! The book that was sixteen years in the making for creative counseling / therapy groups. Dr. Stangline has put together all of her creative counseling group ideas in this 252 page eBook. This eBook is ideal for professional therapist, school counselors, social workers, and school psychologist who utilize group therapy for their clients, or students. Get out of the "group therapy rut" now with this hands on group book with colorful and printable worksheets that your clients can take home. Never have a boring group session again! Visa, Mastercard, Discover, American Express credit cards, Debit cards, and PayPal are all accepted. 1. Hit the Buy Now Button to your right on this page. You will come to the "Pay with a Paypal Account" first. If you want to use Paypal proceed with the "Paypal Sign In." 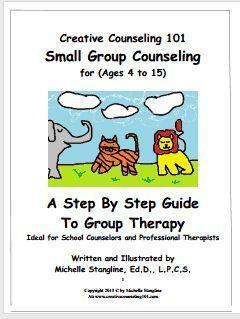 This eBook contains step by step instructions and lesson plans for therapy or school counseling groups. Each lesson plan comes with colorful worksheets that are reproducible, and examples for your group members to use. All lessons can be modified for the use of school groups, or therapy groups. This book is ideal for children and adolescents, but can also be modified for teen, or adult groups. Topics in the book include group therapy for Grief Groups, Anger Management Groups, Friendship Groups, Self-Esteem Groups, Positive Behavior Groups, Stress Management Groups, and Nightmare Groups along with the group ending process.